I used dark brown muscavado sugar and white caster sugar because that was what I had to hand but, given a choice, I would probably use a 50/50 mix of soft brown sugar and golden caster sugar. Place the apricots cut side down in a shallow heavy based pan with the water, honey and sugar. Poach gently without disturbing for 20-25 minutes until very soft but still intact. Remove from heat and sprinkle over the rosewater and lemon juice to taste. Put the lid on the saucepan and leave to cool and for flavours to infuse. 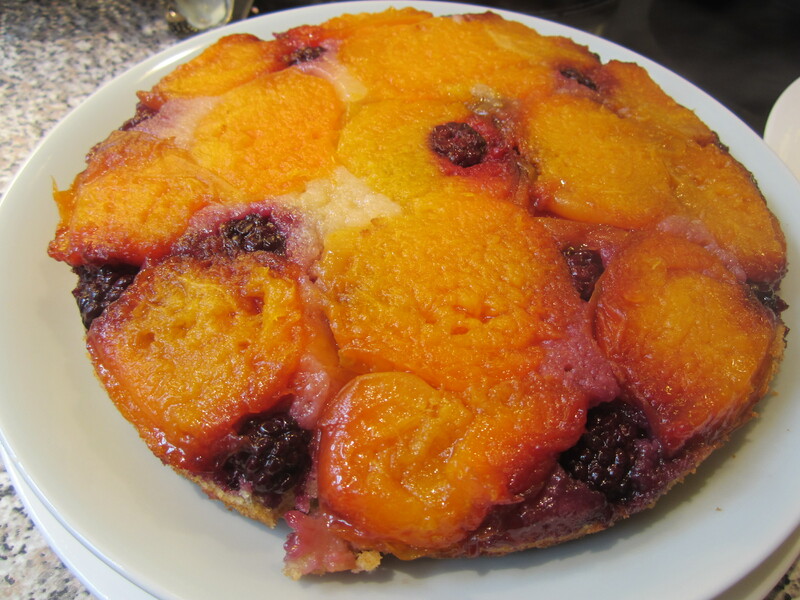 Place the apricots (cut side down), syrup and a few blackberries in a greased, lined 20cm springform cake tin. I then made a classic all in one sponge (modified from Delia Smith Complete Cookery course) by combining the ingredients below using an electric whisk. Adjust the mixture to a dropping consistency with a little milk and spread the batter over the fruit. Sprinkle the top of the batter with a few flaked almonds and some more icing sugar. Bake for around 40 minutes at 160C (fan). Leave to stand for a few minutes before removing and serving.